These 500 sites around the world face extinction from environmental and man-made pressures. Author Holly Hughes wants you to see them before they disappear forever. As a world traveler, writer and editor, Holly Hughes has seen a lot. 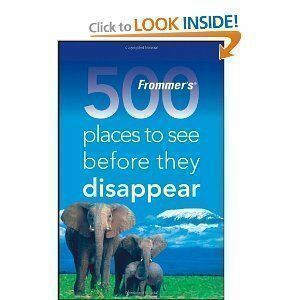 In Frommer’s 500 Places to See Before They Disappear, she takes the reader around the globe to some of the world’s most precious cultural, historic and natural treasures. This book was written for all of those world travelers, eco-activists and cultural explorers who haven’t seen all the attractions that they have on their bucket-lists. With her expertise, Hughes is able to narrate these important attractions with information about why they are endangered, how you can explore them responsibly and how they became so eminent. I found most interesting the piece on Venice, Italy. Did you know that the city of Venice is sinking almost 2.5 inches every decade? Plagued by excessive flooding, the city is battling nature every year. Because, writes Hughes: “In Venice the canals are the cityscape—creating land to go with it was an engineering triumph over nature,” it is obvious why flooding is its main nemesis. The city itself is so rich with culture and history, its eventual, natural demise is truly devastating. However, Venice is only one of the 500 places that are facing imminent extinction. If you are looking to discover the places that are living against the clocks, follow this guide for getting the most out of your trip. If you don’t do it soon, these places might be gone forever.